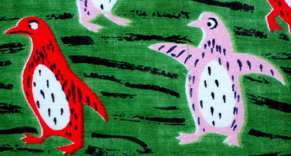 Home » All Blog Posts » Sweaters for Penguins? BBBBBRRRRRRRRR…… “March comes in like a lion but goes out like a lamb” declared English playwright John Fletcher (1624-1647) in his play A Wife for A Month, and indeed, his observation still holds true centuries later. 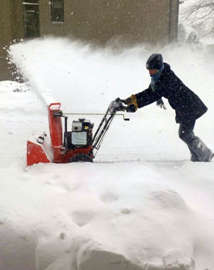 When my nephew and his family transferred from Minnesota to Kansas City last year, they garnered plenty of guffaws when their snow blower came off the moving van in 100 degree heat. Until last week, that is, when perhaps a neighbor or two lined up to borrow it, or simply sigh in surrender as they tossed endless shovels full of God’s bounty. Here my niece gingerly maneuvers through massive drifts of powder. She reminded me “You can take the girl out of Minnesota, but you can’t take….” well, you can finish that one. Although we’ll welcome both the return of daylight savings and Easter this month, spring can’t come too soon for those who’ve had it ‘up to here’ with sleet and snow. It’s enough to make a penguin long for a snuggly turtleneck! 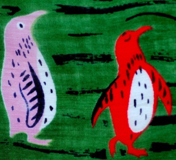 Speaking of which – who doesn’t love those silly birds? They seem to mimic human behavior so perfectly, we enjoy watching them for hours on end. 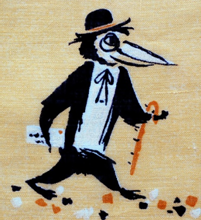 A popular image on children’s handkerchiefs, you can find them in a number of permutations. 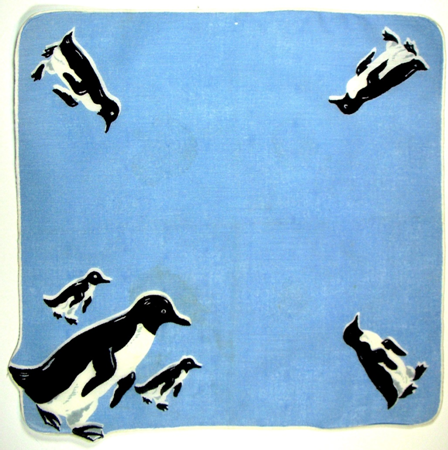 Here’s a particularly lovely ice blue little hankie with penguins circling the perimeter. 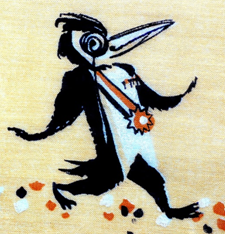 Note how the border pops in one corner to accommodate papa bird’s tail and feet. 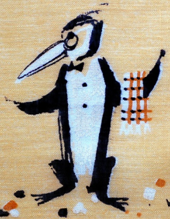 Here’s a 1940’s gem from Tom Lamb with the maestro in a terrific vest, top hat and tails, complete with a wild tie! 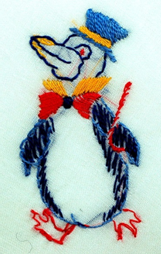 A tiny linen hankie sports a wee penguin embroidered in top hat and tails. Well, I guess they’re always in tails, aren’t they? It’s been delight to find feature length films about penguins like Happy Feet, which won an Oscar for Best Animated Feature Film. 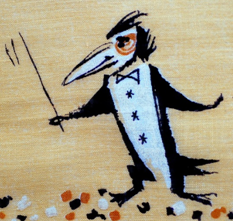 We’ve seen surfing penguins in Surf’s Up, sneaky penguins in Madagascar, even villainous penguins in Batman. We can’t seem to get enough of these creatures. Most amazing of all was the French documentary March of the Penguins,(narrated by Morgan Freeman in the English version) featuring a colony of Emperor penguins making their annual inland migration in Antarctica. What they endure to raise their chicks is nothing short of inspiring, not to mention astounding. 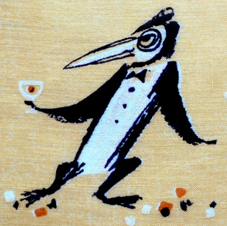 We’re so fond of these birds, their images adorn adult handkerchiefs as well. 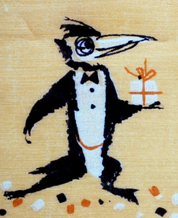 Artist Jeanne Miller illustrates the endless roles for a man in a tuxedo. From James Bond with his martini, shaken not stirred…. 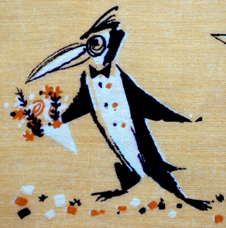 to a gentleman courting with the requisite bouquet…. 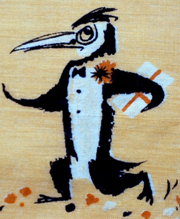 The attention to detail is spot on, as the conductor is the only bird decked out in white tie and uber sparkly shirt studs (diamonds?). 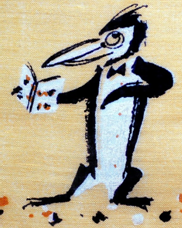 Note too he is the only bird with color employed to indicate under eye circles. Ah, the life of a frazzled and famous conductor. 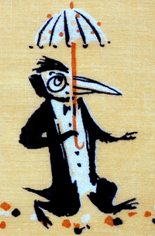 A delicate string tie appears on the sweet and timid gent off to mail a letter, and thus a different personality is conveyed. Whether it’s a Dean Martin crooner, or a diplomatic head of state, complete with sash and monocle (has the gent trailing him has been commandeered to provide shade?) all manner of tuxedoed gents are showcased. 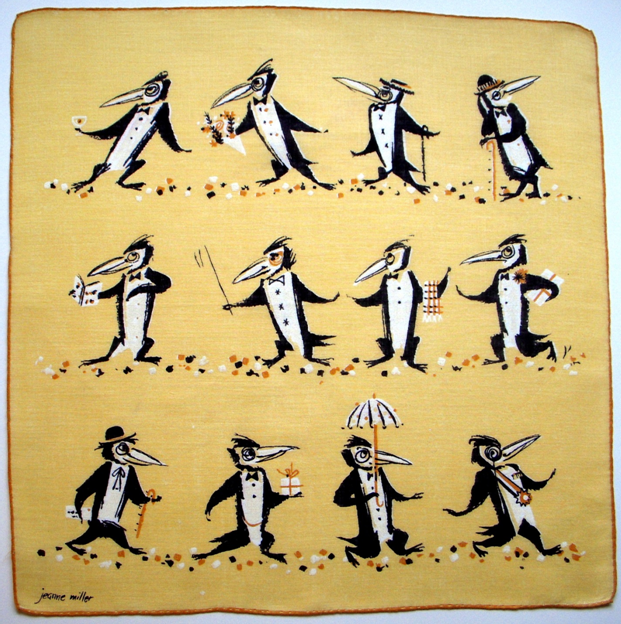 All in all, a terrific handkerchief to own and enjoy. What exactly do you call a group of penguins? (besides fun!) Apparently, the all-encompassing term is a colony, while a group of nesting penguins is a rookery, and a group of penguins on land is referred to as a waddle. How perfect is that? since it’s exactly what they do. 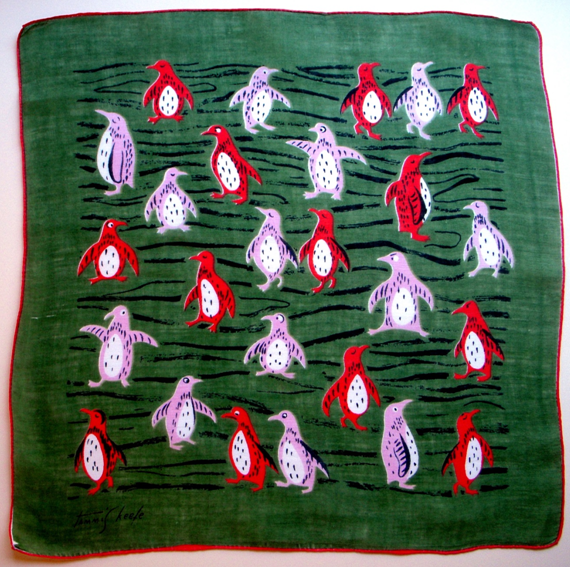 So, here’s a colorful waddle of penguins in wild and fanciful colors. The artist has infused them with such lifelike spirit, you can almost hear their thoughts. Don’t look Darlene. You’ll only encourage him. Bears hibernate in months that have an “r.” No, they eat in months with an “r.” No…wait……. eat regurgitated food? I saw you playing in that school of herring. 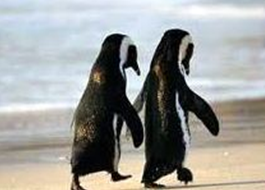 Don’t waddle away from me when I’m talking to you. 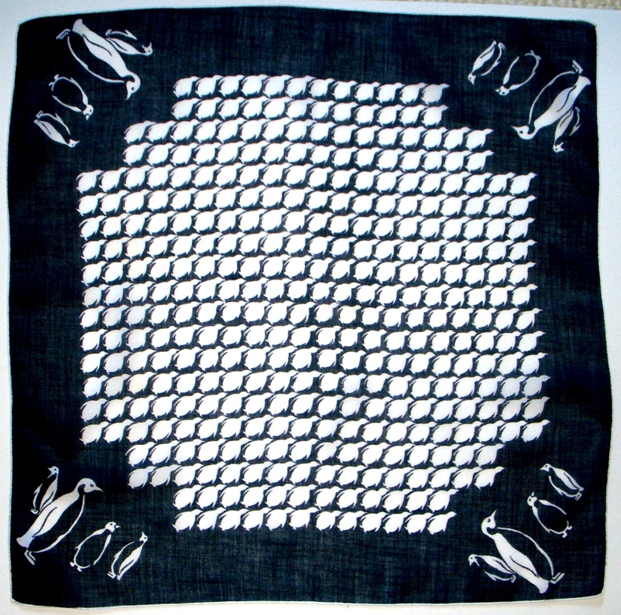 Here’s a stunning men’s handkerchief that clearly conveys the feeling of a close knit colony. 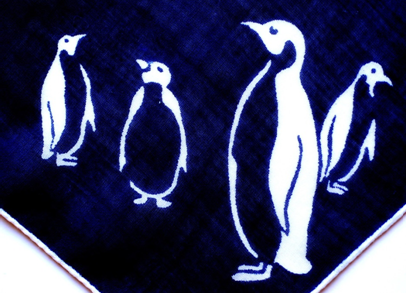 The deep navy of the ocean provides a rich backdrop for the beautifully executed center image of swimming penguins. With the briefest of outlines, their postures are perfectly captured. 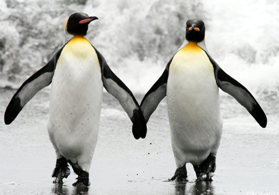 In 2011 an emperor penguin wandered 3,000!!! miles from Antarctica, washing up on a New Zealand beach. He began eating sand, thinking it was snow, and had to have emergency surgery, but eventually he recovered, and hitched a ride home on a research vessel. They are adventuresome little critters. Often however, man is responsible for mishaps that decimate their population, in the form of oil spills. 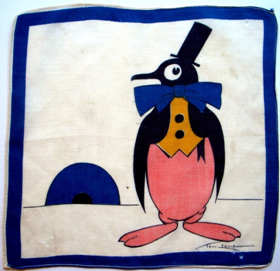 At the outset I referred to penguins wearing sweaters, and in fact, salvaged penguins do exactly that. Cleaning solutions which remove the oil from spills also remove the birds’ natural oils. Plus, their feathers are contaminated, and they get oil in their beaks when they preen, so it’s best to prevent them from doing so. Since they need help with insulation, sweaters help keep them warm as well as healthy. 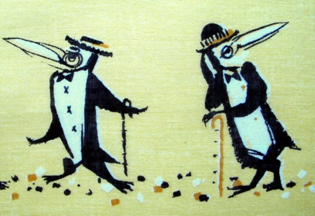 If you’ve never heard James Gordon’s song Sweaters for Penguins, you’re in for a chuckle. 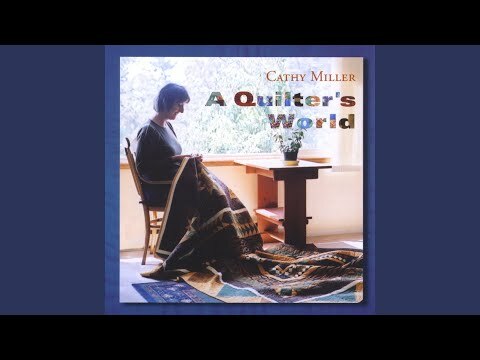 If you have little ones, it’s a pretty catchy tune I think they’ll enjoy. For the cause, we all would knit them socks and underwear. But now we’ve found a new way to show we care. We’re making sweaters for penguins, it does wonders for their self esteem. 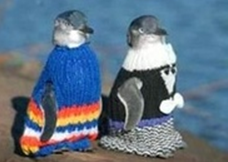 Sweaters for penguins, in the colors of their favorite hockey team. Sweaters for penguins, everybody shout hooray! 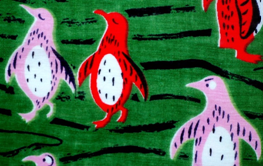 Sweaters for penguins, so life for them won’t be so black and white. 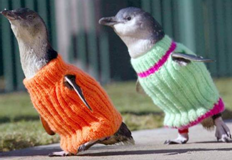 Sweaters for penguins, so they’ll feel less formal going out at night. 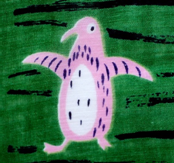 Knit a sweater for a penguin today. Some spend all their efforts fighting hunger and disease. Some devote their time to saving whales or hugging trees. So we work to keep more penguins from remaining in the buff.